Throughout our lives we long to love ourselves more deeply and find a greater sense of connection with others. Our fear of intimacy -- both with others and with ourselves -- creates feelings of pain and longing. But these feelings can also awaken in us the desire for freedom and the willingness to take up the spiritual path. 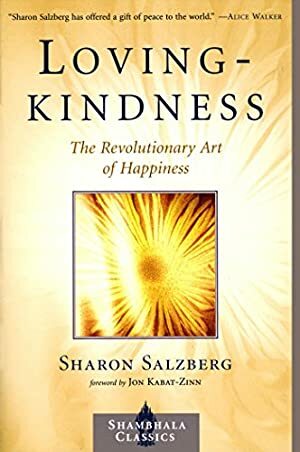 In this inspiring book, Sharon Salzberg, one of America's leading spiritual teachers, shows us how the Buddhist path of lovingkindness can help us discover the radiant, joyful heart within each of us. This practice of lovingkindness is revolutionary because it has the power to radically change our lives, helping us cultivate true happiness in ourselves and genuine compassion for others. The Buddha described the nature of such a spiritual path as "the liberation of the heart, which is love." The author draws on simple Buddhist teachings,wisdom stories from various traditions, guided meditation practices, and her own experience from twenty-five years of practice and teaching to illustrate how each one of us can cultivate love, compassion, joy, and equanimity -- the four "heavenly abodes" of traditional Buddhism. Track It. This book has been £5.00 within the past year. Log In to track Sharon Salzberg on eReaderIQ. to be notified each time the price drops on any book by Sharon Salzberg. to stop tracking Sharon Salzberg. Log In to track Jon Kabat-Zinn on eReaderIQ. to be notified each time the price drops on any book by Jon Kabat-Zinn. to stop tracking Jon Kabat-Zinn. We started tracking this book on June 20, 2012. This book was £6.17 when we started tracking it. The price of this book has changed 126 times in the past 2,499 days. The current price of this book is £6.06 last checked 3 hours ago. This lowest price this book has been offered at in the past 90 days is £5.93. This lowest price this book has been offered at in the past year is £5.00. The lowest price to date was £3.10 last reached on November 30, 2015. This book has been £3.10 one time since we started tracking it. The highest price to date was £11.75 last reached on June 26, 2018. This book has been £11.75 9 times since we started tracking it. We last verified the price of this book about 3 hours ago. At that time, the price was £6.06. This price is subject to change. The price displayed on the Amazon.co.uk website at the time of purchase is the price you will pay for this book. Please confirm the price before making any purchases.